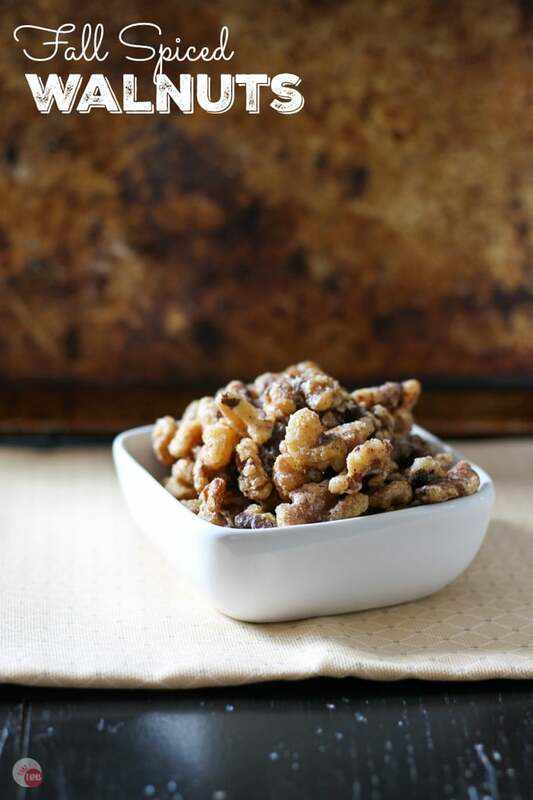 These crispy fall spiced walnuts are toasted and covered with a light and crispy sugar coating that is full of Earthy spices. Cinnamon, cloves, and nutmeg get you ready for the holidays! 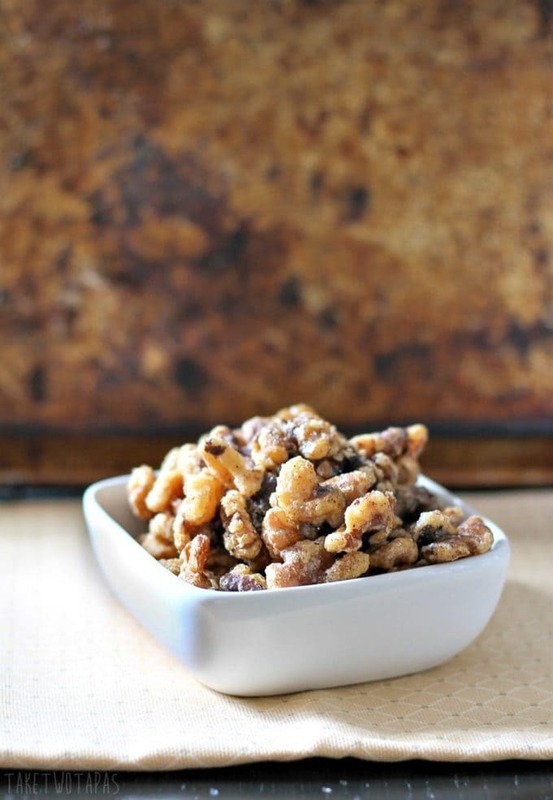 Fall Spiced Walnuts make a great snack and an even better holiday party hostess gift! Fall is in the air and it feels great! “Not too hot, not too cold, you just need a light jacket.” I love that quote from the not-so-bright beauty pageant contestant on Miss Congeniality! I know that it is officially Fall but I’m furious that my local store has filled the front door of the store with those God-Forsaken Cinnamon Brooms! I don’t like to inhale a could of cinnamon when I walk in the door and feel like I completed the stupid cinnamon challenge while I am trying to shop for bell peppers and lettuce! Also, they are right next to the Starbucks, so I have to wade around everyone getting their Trenta PSLs that don’t even contain pumpkin! After this most recent trip to the store, I won’t be able to taste anything but cheap cinnamon for a week! Just take me to the Fall Spiced Walnuts Recipe Already! If you’d rather skip my (very helpful, I think) tips and tricks, essential cooking info, and similar recipe ideas – and get straight to this delicious easy Fall Spiced Walnuts recipe – simply scroll to the bottom of the page where you can find the printable recipe card. Of all the aromas we can smell in fall; fireplaces, football concession-stand foods, pumpkin pie spice, mulled apple cider, my Ma’s spiced pecans were always my favorite. I decided to make her recipe but with walnuts! 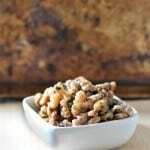 These Fall Spiced Walnuts encompass all that is fall and will even work well in the winter season too. giving as gifts to foodie friends, teachers, and party hostesses. They are easy to make and sure to please! My Ma used pecans but I am having a love affair with walnuts this week so they got to come to the dance instead. This recipe works for just about any nut you choose but you might have to watch the cooking time for smaller sized nuts. Q: Can I make the Fall Spiced Walnuts without sugar? A: You can use a sugar substitute that is specific for baking. I have never tried this though. Q: Can I freeze my Fall Spiced Walnuts? A: Yes, you can! If you want to make them ahead of time, they will last for 3 months in the freezer. Q: Can you make the Fall Spiced Walnuts in the crockpot or slow cooker? A: I have never tried this specific recipe in a crockpot but here is a link to one similar. 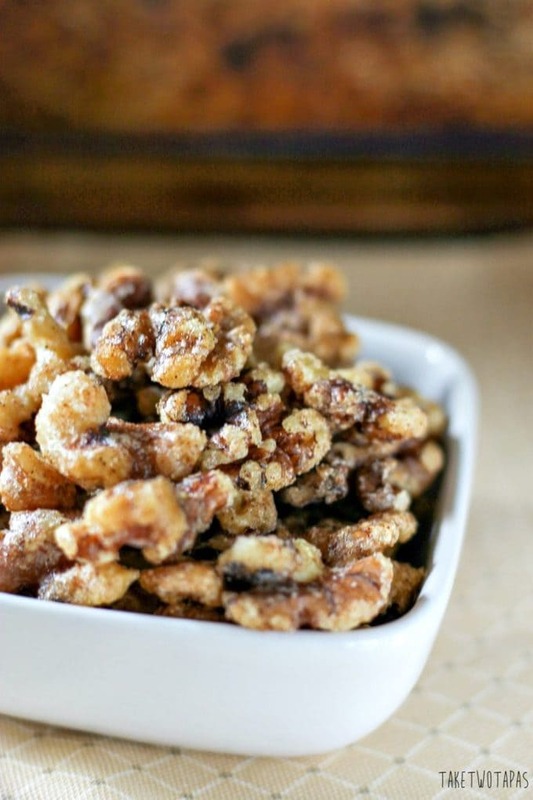 Enjoy these Fall Spiced Walnuts as a great post-workout snack! Nuts, like fruits, have a season so feel free to try this recipe out on other nuts that are in season! These Fall Spiced Walnuts make great hostess and teachers gifts so wrap some up for a party or your kid’s teachers! Instagram, Pinterest, Facebook, and Twitter! 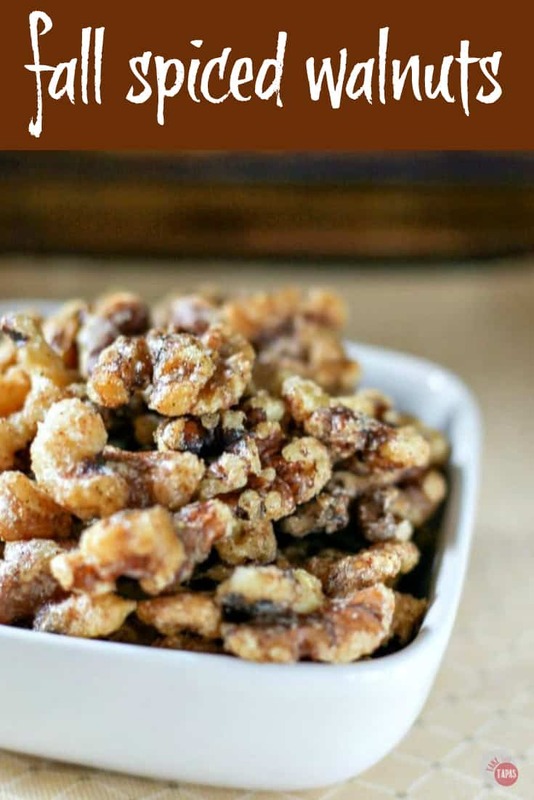 If you love this Easy Fall Spiced Walnuts Recipe as much as I do, please write a five-star review, and be sure to help me share on Facebook and Pinterest- with the “tried it” button – you can now add pictures into reviews, too! 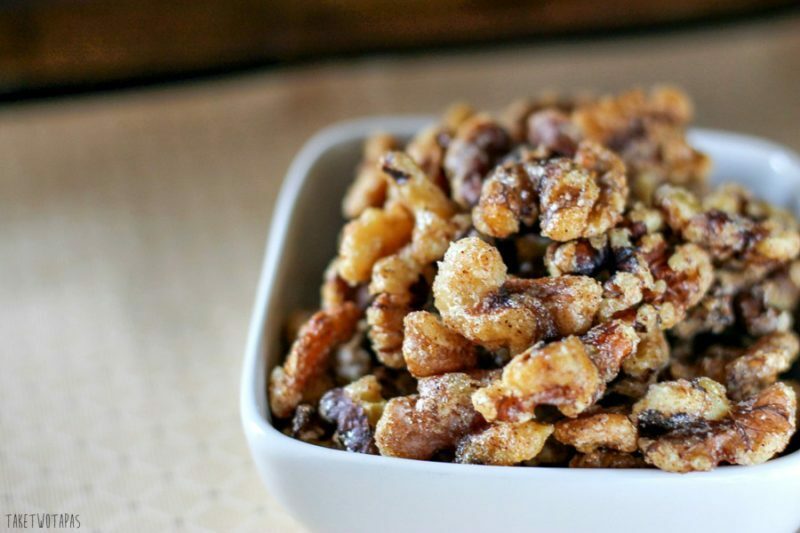 These crispy walnuts are toasted and covered with a light and crispy sugar coating that is spiced with Fall spices. Cinnamon, cloves, and nutmeg get you ready for the holidays! Add enough water to make it messy (~1/2 cup). Add walnuts and mix enough to coat the nuts. Spread out on a foil-lined baking sheet. Bake at 200F for 1 hour being sure to stir every 20 minutes. Take out and let cool completely. Store in an airtight container for up to 2 weeks or freeze for three months. *If you like this recipe, leave me a comment and rate it with some stars. Thank you! Outstanding! Had them warm out of the oven on top of vanilla bean icecream. The only problem is that I can’t stop eating them. I’m sorry 🙂 I think that might be a good problem to have… Next time you will have to double batch. So glad that you like them! These look delicious. I wonder though, can they be made with splenda? Yes they can! Just substitute equal amounts! Thanks for reading! Love love love candied nuts. These walnuts look divine Jennifer! Thanks for reading Allie! I was thinking of trying this spice mix on some almonds since my friends prefer them to walnuts! Walnuts are my father in law’s favorite! These will definitely make me his favorite daughter in law. Okay, I’m the only daughter in law. But I know he’ll love these none the less. You can still be the favorite but these nuts won’t hurt! 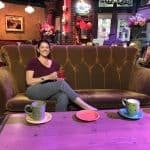 Thanks for reading Amy! These are a great fall snack! Who can resist a candied nut? I know that I can’t! I started eating more nuts last year and now I am addicted. Sweet OR Spicy! I think this is perfect to make and have a bowl on the counter, mix in with a buffet, or just mixed with appetizers! These also would kick up a salad any day of the week! I try to keep some there so I will snack on them instead of all the other holiday treats. I know they have some sugar on them but at least with the nuts I feel like I am a little healthy:) Thanks for reading! Yes they would be great on a a Fall harvest salad! YES!!! I am LOVING this! 😀 I was just telling my husband we need to get some walnuts, and this is such a great way to spice them! I do love cinnamon too, but there definitely is a limit to it! 😀 I hope the cinnamon doesn’t contaminate everything this winter! 😉 hahaha!! The smell of Cinnamon challenge is definitely not something you want to be bombarded with. But in these spiced nuts? Absolutely yes!! I think I have a genetic problem where it actually feels like it’s burning my skin if I eat or smell too much. Oh well. I am getting to where I can eat more and more but I hope that is not because I am getting old and losing my taste buds!